The cold spell is forecast to end this week but it’s not going without a fight. Last night it had snowed, not very much but enough for us to abandon any plans of going to the market today. There probably won’t be one anyway. However, the temperature had risen to a sweltering minus 1.5°C this morning and the house feels much warmer for it. The weather has severely curtailed my programme of activities. I wanted to get to the Toulouse Violet Fair: no way. I wanted to get to the truffle market at Limogne, which ends in late February/early March: with the hard ground and arctic temperatures there won’t be any truffles. The upside is that I have got a lot of work done, short stories written and books read. I thought you’d like to see the picture above of someone who knows how to keep warm: Felix in the log basket next to the woodburner. 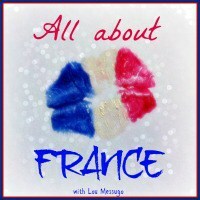 Before moving on to the songs and stews, I ought to mention that my blog is two years old today. This is my 199th post (didn’t quite make the 200). The blog has had around 49,750 hits altogether (didn’t quite make the 50,000, but I might if you keep coming back today). I’ve really enjoyed it, learned a great deal, made a lot of virtual friends – some of whom I hope to meet one day – and intend to continue as long as I can find things to write about. Thanks for the nice comments and awards or just for reading my scribblings. There’s nothing like singing for generating a warm, rosy glow. The choir that sang in the Christmas carol service at Parisot was so successful that the organisers decided to make it permanent. The first rehearsal took place last Thursday evening. About 28 of us, of various nationalities, braved the biting cold to turn up and sing under the baton – actually, he doesn’t use one – of maestro Peter Nowfel. You can see the back of his head immortalised in my post about the carol service. He lives in Aveyron and had further to travel than anyone. Now, I’m not the world’s best singer. In fact, I haven’t sung in a choir for 35 years. However, I thought I’d have a go and am quite prepared to drop out if I become too embarrassing. I put myself with the sopranos, which is a good thing since there are only five of us against nine altos. But I’m not sure if I can still hit the high notes. Time will tell. Or Peter will. We started with a piece by Saint-Saëns and then moved on to one that Peter composed himself. Very nice it is too – not that I’m trying to curry favour, of course. We already have two concerts planned plus another carol service. Plenty to keep us busy. Southwest France specialises in some rib-sticking dishes. Just what you need to keep the winter at bay. One of them is cassoulet, a stew of haricot beans, Toulouse sausage and duck or goose confit. I am indebted to BBC olive [sic, without a capital] Magazine for the following recipe, to which I have added a few refinements of my own. The denizens of Castelnaudary, Toulouse and Carcassonne, all of whom claim to have invented the dish, would not approve of this version. In fact, there’s a wonderful YouTube video where an Englishman tries to sell ‘cassoulet anglais’ to the Castelnaudariens and barely escapes with his life. However, the following recipe is quick, easy and delicious. If you can’t find Toulouse sausage, any spicy sausage will do. Also, the recipe includes butter beans, which you can find tinned. I prefer to use haricots lingots, slightly longer and flatter, already prepared in goose fat. Terrible for the cholesterol but it does make a difference to the taste. Fry leeks and garlic in butter/oil in a casserole until softened. Cut sausages into one inch chunks and brown in a frying pan. Do the same with the bacon. Add to the leeks and garlic. Add the wine, stock, butter beans – or haricots lingots – and cayenne pepper. Cover and simmer gently for 10-15 minutes until piping hot. Season to taste and add chopped parsley, if liked. Serve with plenty of green veg. You don’t need potatoes. This has become one of our winter staples. This entry was posted in Food/drink/recipes, Weather and tagged Carcassonne, Cassoulet, Castelnaudary, SW France, Toulouse, Weather. Bookmark the permalink. Congratulations on your two year blog anniversary! It’s been hard to find blog inspiration during the past several days of freezing weather. I’m glad it’s starting to thaw! I, too, wanted to try the truffle market at Lalbenque, but who wants to get out in the bitter cold?! Here’s to a warm-up and a big bowl of cassoulet…I’m going to try your recipe! It’s not been easy to get out and about and find things to write about during the past couple of weeks. Lalbenque is the big truffle market in the region, but there is a small one at Limogne every Friday morning, which is probably closer to you. It starts at 10 a.m. and lasts only a few minutes. I would be surprised if there were any truffles this week – next week might be better. I hope you enjoy the recipe – it’s very qucik and easy. HAPPY ANNIVERSARY! And all those hits, brilliant. 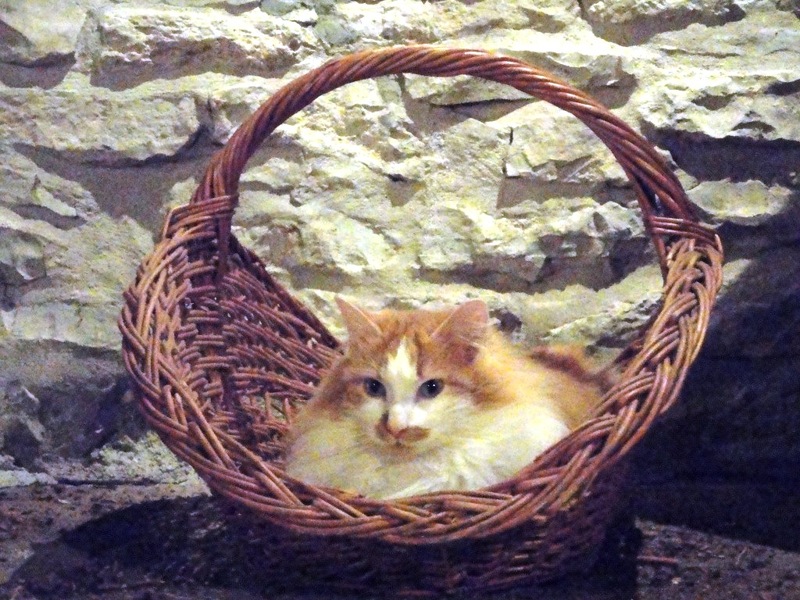 Our cats love baskets too and it doesn’t matter how inaccessible they are, they always find them. Wish I could sing – my voice is enough to send anyone scuttling for cover. Enjoy your concerts. Thanks, Sue! Our cat gets himself into the most unlikely places and still seems to be comfortable. I’m sure I will enjoy the concerts – the question is whether anyone else will enjoy my singing! Nothing like cassoulet to warm you up, especially if you have nothing else to do with your day (because sometimes it’s difficult to move afterwards). Congratulations on your staying power (blog), I hope I manage to last that long. 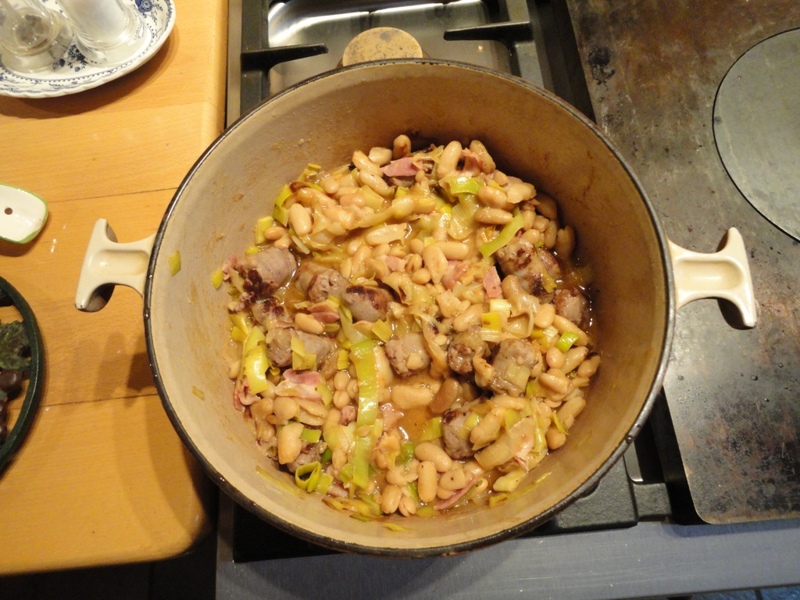 Cassoulet can be rather heavy but this version is lighter, perhaps because the proportion of meat is less. He is lovely, isn’t he? (and thinks he is, too). He turned up one day two years ago aged about 6 months and stayed. As long as I find things to write about I’ll continue the blog. As soon as I struggle, I’ll stop. Happy Blogiversary! And what a cute photo. That’s an impressive number of hits – well done, and well deserved. Thawing out here too. Only one flood from an unnoticed burst pipe in Caiti’s bedroom as the pipes thaw out – so far! That cassoulet looks delicious. We’ve only had the tinned variety up till now, but I’m tempted enough to have a go at your version. Anything with leeks is worth trying. Have fun singing. There was a suggestion our pre-Christmas singing group might keep going all year, but I think the cold temps put paid to that for the time being. I’ll have to ask around and see if there might be interest. I love a good sing-song. The tinned variety of cassoulet isn’t bad. It lends itself quite well to preserving like that. The leeks make a difference – but they aren’t included in the classic variety. I hope you enjoy it if you try it. It really is very quick and easy.